Public-sector unions have nobody to bargain with. In this series, we've looked at the basic law of nature that everyone and every organization must produce more of value than they spend; and seen the evidence that the Wisconsin public schools in general and the teachers unions in particular don't. In this final article, we'll look at how that can be and how it must be fixed if the entire state, indeed ultimately our nation, is not to collapse in bankruptcy and failure. Whither the Checks and Balances? As we've repeatedly pointed out, incompetent or overpriced private companies are driven to bankruptcy every day by more efficient competitors, as individual customers choose the good company over the bad one. Car buyers choose Toyota over GM; shoppers choose Wal-Mart over K-Mart. This process is very hard on employees of the failing company, but it's good for the general public, for the economy as a whole, and for government tax receipts. We've all benefited from Toyota's drive to increase quality and Wal-Mart's laserlike focus on low prices because you and I get more while spending less. Toyota and Wal-Mart don't have to suffer outrageous union demands; they've moved heaven and earth to stay union-free in the United States. However, unions aren't always the automatic death sentence conservatives often assume them to be: Southwest Airlines is highly successful, popular with its customers, and almost entirely unionized. Even Toyota, in its home country of Japan, is heavily unionized; quality doesn't seem to suffer the way it did in Detroit with the UAW. Why? Because unlike with Detroit's Big Three, the executives of Southwest and Toyota did their jobs during union negotiations and refused to sign labor contracts they couldn't afford. The workers of Southwest have confidence that management knows what it's doing - unlike any other American airline, Southwest has been consistently profitable for decades - and will fairly share profits with employees. Why strike if you're already being well taken care of? For historical reasons, Detroit's management-union relationships have always been highly combative; perhaps for psychological reasons, it seems that Detroit executives didn't really believe their giant corporations could ever fail. So when the unions demanded more! more! more! and threatened to strike if they didn't get it, management knew the threat wasn't an idle one, but also didn't seem to mind paying an unaffordable price for peace. The result? Bankruptcy. So we see that a well-run unionized company will be honest but firm with its union: paying fairly, but not paying more than the company's profits can afford. Boeing is heavily unionized in Washington state, but rather than pay outrageous increases, it let the workers go out on strike for two months in 2008. After no paychecks for that long, the union was willing to compromise. Boeing compromised too... but it's building a new factory in right-to-work South Carolina after its workers there voted out their union. The point is that when a private-sector union goes to the bargaining table, management sits on the other side. Union leaders want more for their members while not killing off the company entirely; management, obviously, wants to pay less so as to make more profits for stockholders and bonuses for themselves while trying to avoid disruption of production and inconvenience to customers. Between them, all interests can be represented. That is not true for public-sector unions like the ones protesting in Wisconsin. When the teachers union contract comes up for renewal, who does the union negotiate with? Generally the school board. But the school board doesn't pay them - it's not their money at all. It's the taxpayers', who don't have a seat anywhere near the bargaining table. What's worse, it doesn't even matter if the school board overpays. The government can't go bankrupt. The school board members can't be fired by stockholders since there aren't any. The school board can be voted out - but unlike with a normal private-sector union, the union members can vote for their own bosses because they're voters too. This never happens in private-sector corporations; on the handful of occasions when it's been tried, as when United Airlines was "employee-owned", the results were every bit as financially disastrous as Wisconsin's public schools. In fact, there's long been an "iron triangle" of public-sector union corruption: Union bosses take the enforced dues extracted from public-sector workers, who are required by the contract to join the union and pay dues as a condition of employment; give the money to Democrat politicians as campaign donations; "suggest" that union members work to elect Democrats on their own time; and then shake hands across the bargaining table, knowing that the politicians will be glad to throw more taxpayer cash at a union which, they know, will simply turn right 'round and give it back to them. Nobody represents the people who are actually paying the money - the taxpayers. Nobody represents the customers (the schoolchildren) or even cares about them - the public school is a virtual monopoly and almost all parents have to send their kids there no matter how lousy or inefficient they are, because they're "free" to the consumer and required by law. Nobody cares about the finances of the town, the county, or the state - because taxes can always be extracted by force of law, and anyway, when the bills come due the politician will probably have moved on to higher office and it'll be someone else's problem. In effect union representatives sit on both sides of the bargaining table, with no one sitting in for taxpayers. In 2006 in New Jersey, this led to the preposterous episode in which Governor Jon Corzine addressed a Trenton rally of thousands of public workers and shouted, "We will fight for a fair contract." He was promising to fight himself. Except that now the clock has run out; Wisconsin's finances and schools are in a state of collapse, and the problem can't be punted anymore. 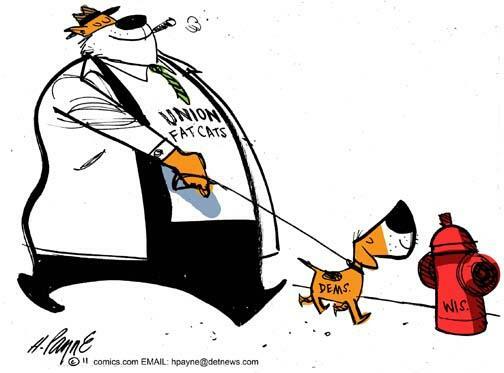 What's more, the voters have finally realized they're being fleeced; despite dumping their usual massive resources into Democratic campaigns, the unions were buried under a Republican landslide sweeping Gov. Walker and a Republican legislative majority into the state house in Madison. Much the same has happened in New Jersey, Ohio, Indiana, and beyond. It is impossible to bargain collectively with the government. Upon employees in the Federal service rests the obligation to serve the whole people, whose interests and welfare require orderliness and continuity in the conduct of Government activities. This obligation is paramount. Since their own services have to do with the functioning of the Government, a strike of public employees manifests nothing less than an intent on their part to prevent or obstruct the operations of Government until their demands are satisfied. Such action, looking toward the paralysis of Government by those who have sworn to support it, is unthinkable and intolerable. There were so-called public sector unions in FDR's day, such as the National Federation of Federal Employees, to whose president Roosevelt wrote the letter just quoted. But the NFFE's own constitution explicitly forbade strikes, and it didn't bargain for employment contracts in the usual sense. It wasn't really much more than a special-interest lobbying group like the AARP or NRA, voluntarily joined by individuals who shared a common interest in petitioning for redress of grievances, which of course is explicitly protected by the Constitution. To this day, federal employees have no collective-bargaining rights, yet they seem to be doing rather well for themselves; various studies have shown that, when the value of benefits and pensions are included, federal workers receive twice what the average private-sector taxpayer who pays their salaries gets. Compare that to what we see in Wisconsin, where angry mobs seem to expect the right to, well, whatever money they choose to demand, despite their preferred politicians having lost in the polls - and, in fact, collecting a taxpayer-funded salary while at the same time storming the statehouse to hold the taxpayers to ransom! Nothing could be more unfair, unjust, or un-American. Wisconsin is in a sorry state, but in a way that's a good thing. When times are good, most politicians will prefer the easy route of wasting taxpayer dollars; after all, you can always get more of those. And when you can't? That's when the true leader arises, to do what needs to be done, scraping the barnacles and leeches off the ship of state. Yes, American workers have the right to assemble into unions should they choose to do so - and their employer should equally have the right to reject union demands and replace the union workers with others more amenable. What's more, American customers must have the right to buy from multiple suppliers, providing an essential check on the incompetence and greed of any one union or company. Government services, by their nature, are a monopoly. Government workers, as citizens, vote for their own bosses. Therefore, they have no right to unionize, because fair bargaining is impossible and the only result is grand larceny of the taxpaying public as a whole. At long last, America's governors are realizing what FDR knew long ago. It would be great to have another Reagan, sacking the striking PATCO air traffic controllers and eliminating an entire union at a stroke, but there's no need to be partisan: when it comes to public-sector unions, following the teachings of Franklin Roosevelt is just as good. 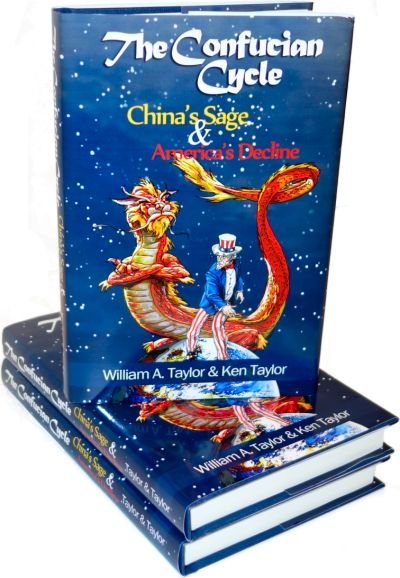 Or, we could simply wait for our entire government and economy to implode and for the whole country to descend into the abyss of the Confucian Cycle. Thanks for bringing the Left's pathetic posturing to light (viz. John Corzine's promise to fight himself). The Left is pure poison - in every country, in every age. It is a huge small business (not to mention privacy) killer. My apologies if you have already written about this. "Wisconsin's 14" got a heroes' welcome on the steps of the state Capitol. That about says it all for public-sector unions - their heroes are public employees who REFUSED to do the job they are still being paid to do. Sack them all, every last one! Check out "right to work" on face book and LIKE and SHARE! With scandals swirling, Big Labor is looking for a bailout from the Obama Administration that American freedom can't afford. Public unions made our NJ state the #1 tax burden for property taxes in the entire country. So sick of property taxes and the unfairness in our state. We have to many exceptions on our 2% property tax cap from Gov Christie for healthcare increases for public workers and retiree health is totally free still under the reform. Who gets that anymore? So sick of paying more then the entire country pays for them or anyone else gets here. Gov Christie slowed down the increases, but many new schools built also with a debt exception and another different tax rate then the 2% here. And then there is the double dippers too.